"This is a cool salad for a hot day. I love to serve it with grilled chicken or fish. It is also great as a snack with pita chips." Place the cucumber slices into a colander set in the sink, and sprinkle with salt. Set aside and allow to drip. In a salad bowl, mix together the red onion, red bell pepper, lime zest and juice, cilantro, sugar, curry powder, and hot pepper sauce until thoroughly combined and the sugar has dissolved. Drain the cucumber slices, and pat them dry with paper towels. Stir the cucumbers into the salad. 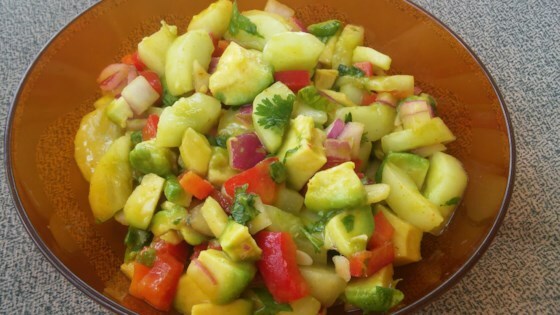 Gently toss the avocados with the salad and serve. If you are not going to serve this immediately do not peel, chop and add the avocado until just before serving. Also, if you are in a real hurry, you can skip draining the cucumbers, but any leftovers you have will get watery. I think this is just personal preference, but we found this a little on the sweet side. Did enjoy the combination of cucumber and avocado. I made this salad for a Labor Day pot luck. Everyone LOVED it!!!! It was so easy to make. This salad is cool and refreshing but packs a little zip. So delish! Made as written minus the red peppers, personal taste, turned out great!